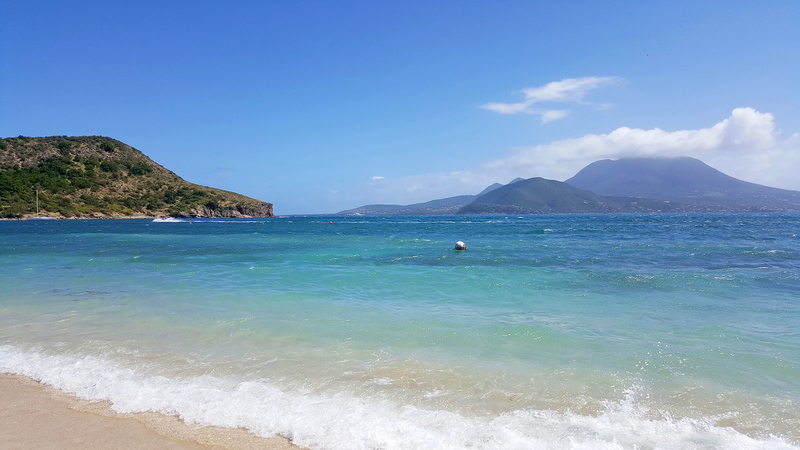 Cockleshell Beach in St Kitts – A spectacular day in a gorgeous setting. 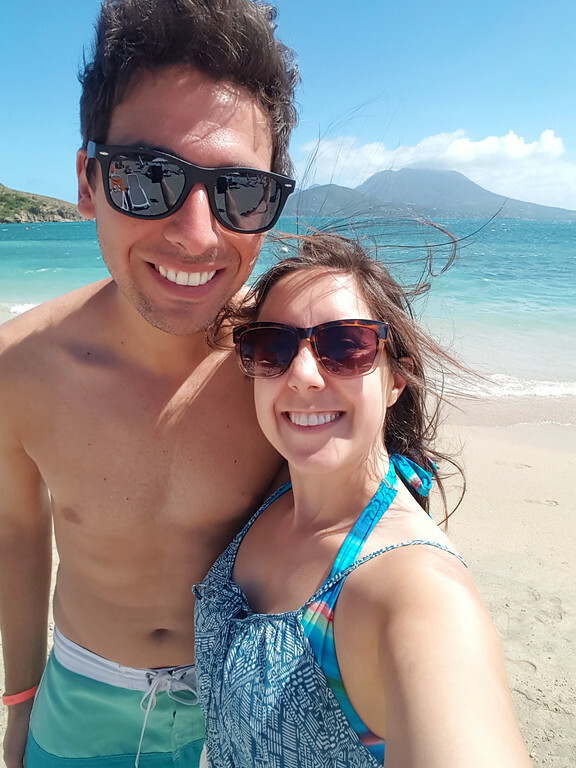 It was our first time travelling to St. Kitts and Nevis. 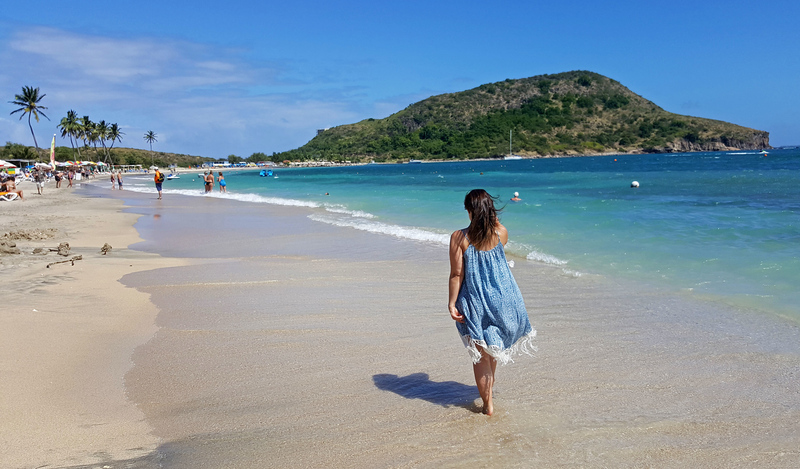 Not only was I really excited to check a new Caribbean island off my list, but I’d heard it’s one of the most stunning. 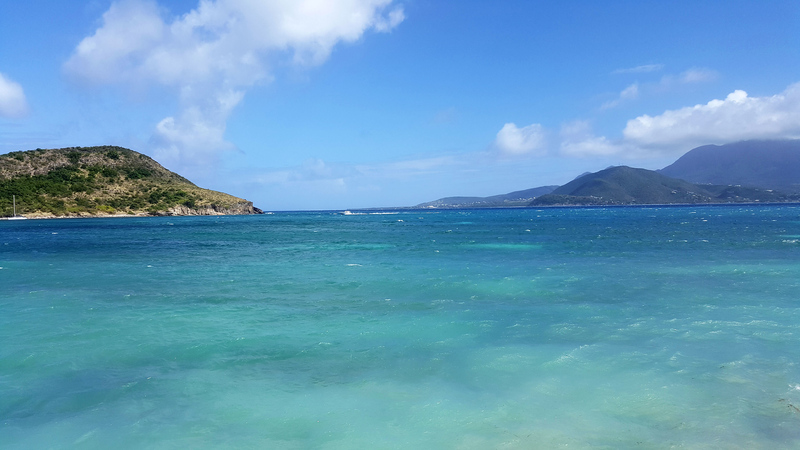 After visiting Cockleshell Beach in St Kitts, this Caribbean country definitely lived up to the hype. 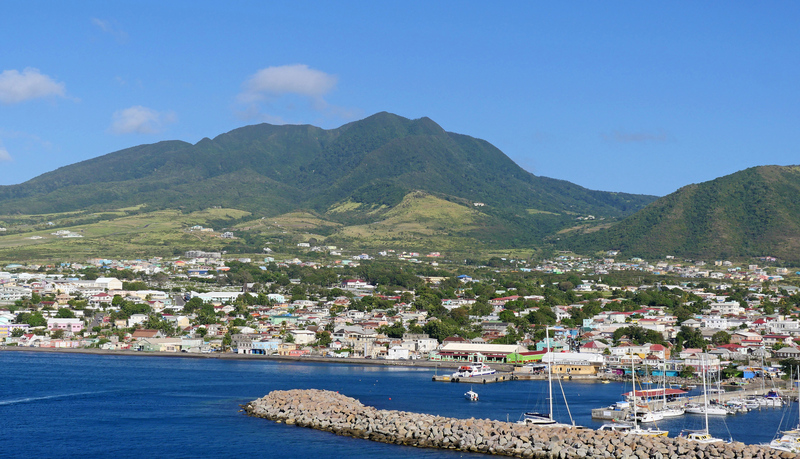 Arriving via the MSC Divina, we reached the cruise port in the capital city of Basseterre. 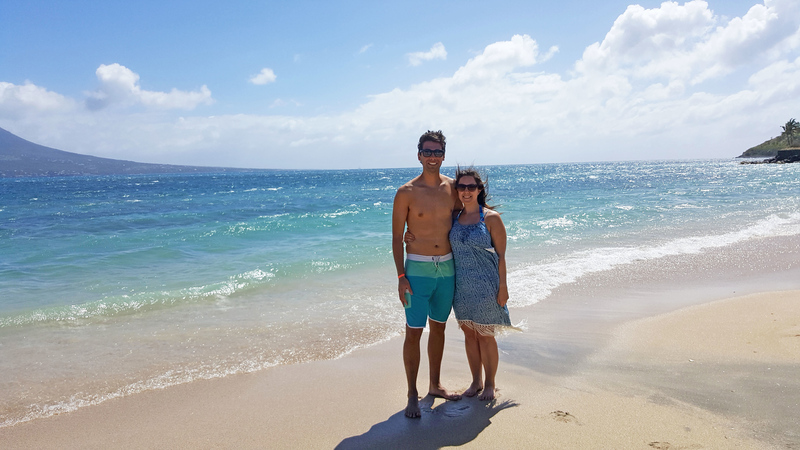 To have an easy and stress-free vacation, we booked a beach excursion directly through the cruise ship. It was a half day trip that included transportation to the beach, as well as a lounger. The use of an umbrella was available at an extra cost, but we were happy to lay in the beautiful sunshine. 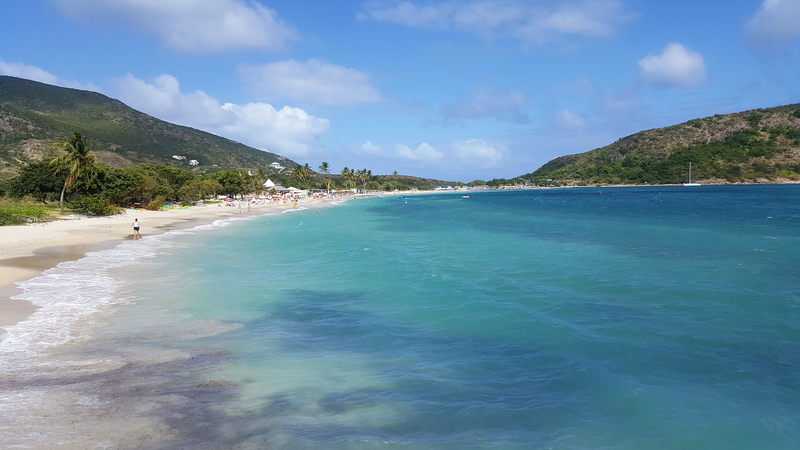 Have you been to St. Kitts before? What’s your favourite beach in the world? 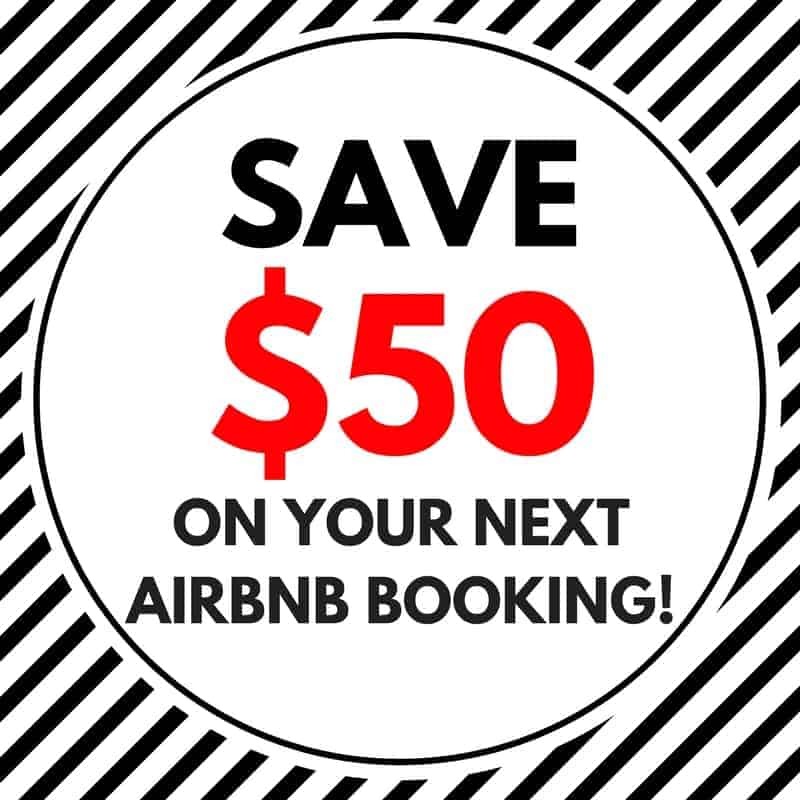 It was approximately a 30 minute drive from the cruise port in Basseterre to Cockleshell Beach. Fortunately, it didn’t feel like it was that long because we had such incredible scenery to look at throughout the ride. Driving in an air conditioned van, we gazed out the window at the mountains and the ocean. We peered out the windows as the road looped around the mountains, and even through them at times. 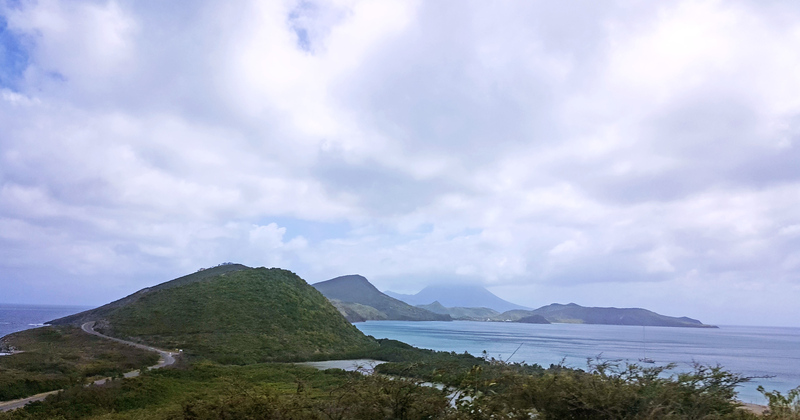 One narrow stretch of road divides the Atlantic Ocean and the Caribbean Sea, offering views of both on either side. On the way back, there was a scenic overlook where the driver typically stops for photo opportunities. Unfortunately, it had just started to pour rain when we were heading back and there wasn’t the chance to do this. However, we were grateful that it didn’t pour rain while we were on the beach. Cockleshell Beach is a secluded two mile stretch of sand at Cockleshell Bay. Our bus dropped us off near the Spice Mill Restaurant where there was also a small bar and gift shop. There were washroom facilities there, too. Down by the beach, Justin and I claimed two lounger chairs in close proximity to the water. We were pleased that it wasn’t very busy there at all. As it was such a lengthy stretch of beach, the chairs were pretty spaced out. There weren’t even that many people swimming in the ocean. The sand was powdery and soft on our feet. The water was just spectacular, both for swimming and for its looks. Gradient shades of turquoise blue extended off to the horizon where mountains rose from the sea in the distance. 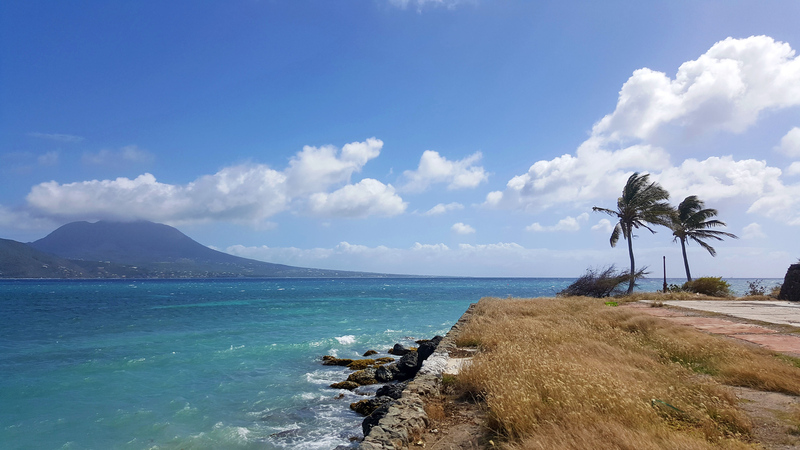 Cockleshell Bay faces a stretch of water called The Narrows, with gorgeous views of the neighbouring island of Nevis. I’d never visited a beach before where there were lush mountain views directly ahead, not connected to the mainland. Breathtaking was an understatement. 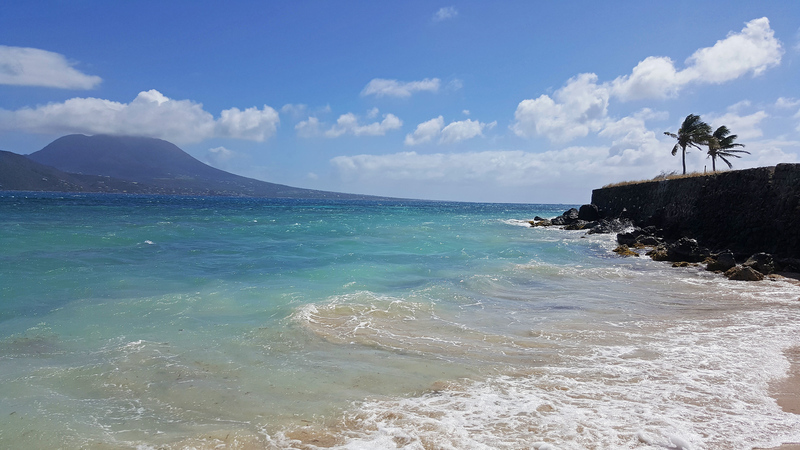 Cockleshell Beach in St Kitts is the perfect beach to walk along barefoot. Feel the breeze in your hair and the sand between your toes. We walked from our beach chairs to the far western point of the bay where we discovered a rock wall. Just beyond the beach, there was a sandy path leading up to an overlook with palm trees. It provided an excellent vantage point to see the entire beach. For the two of us, Cockleshell Beach checked all of the boxes to make it the perfect beach destination. First of all, it’s absolutely gorgeous. The water is warm and the views are stunning. Next, it’s not very crowded. Despite being a popular cruise ship stop, there’s such a lengthy stretch of beach here, it’s easy to have your own space. Third of all, it’s a fantastic beach to walk around and explore. 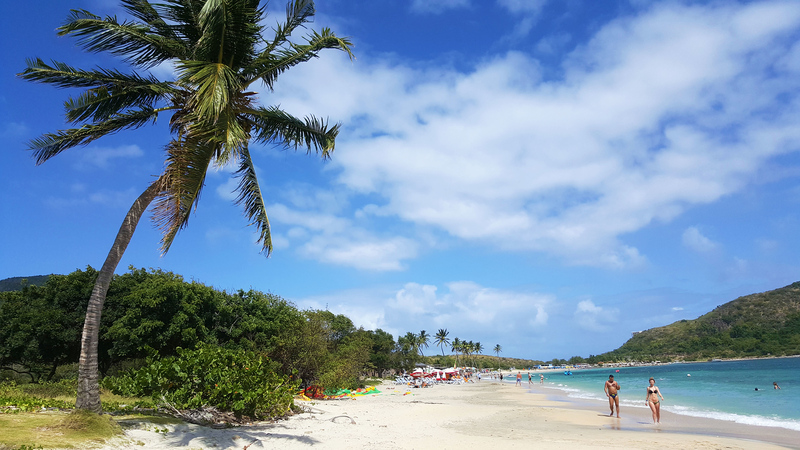 While we didn’t walk the entire length of the beach, you could explore the east side to visit the Reggae Beach Bar and Grill. There are also water sports and equipment available for rent there. While that end of the beach seems to be a little more happening, we loved our romantic, quiet space near the Spice Mill Restaurant. We booked an excursion through the MSC Divina, our cruise ship. 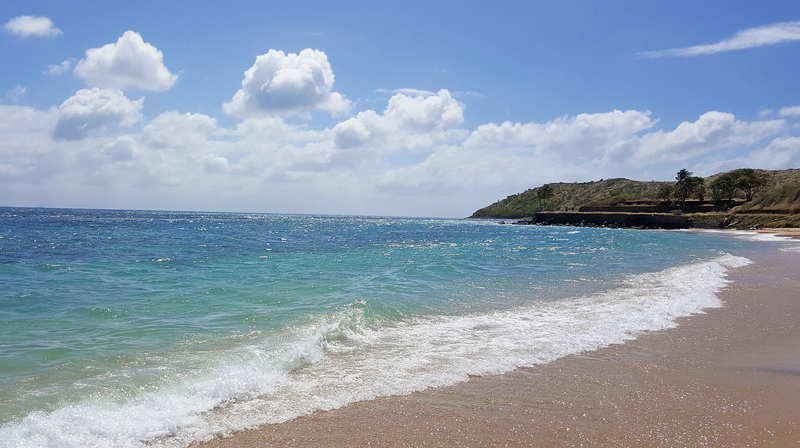 We didn’t even know that we’d be going to Cockleshell Beach ahead of time – we just knew we’d be going to a beautiful beach somewhere in St. Kitts. 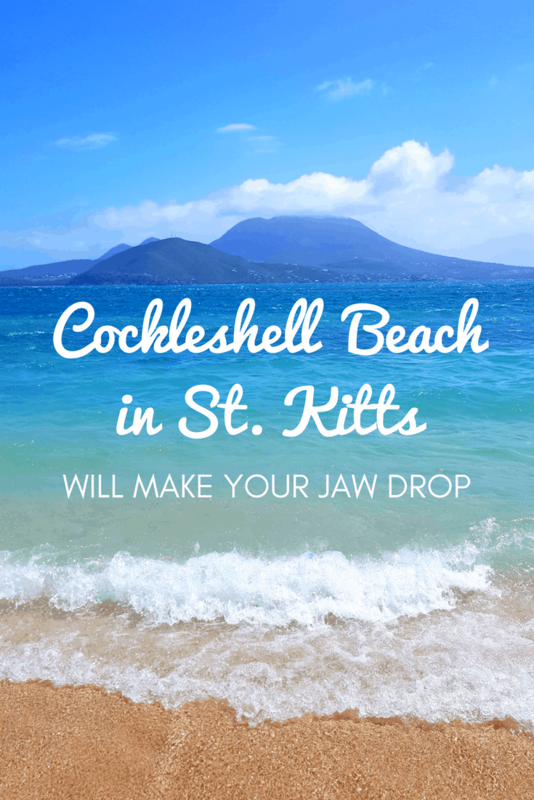 If you’d like to specifically go to Cockleshell Beach without booking a tour, it’s entirely possible and very easy to do so. When you walk out into the cruise port, there will be tons of taxi drivers offering transportation to various places all over the island. Request to go to Cockleshell Beach and you’ll be on your way. Please keep track of the time. If you’re on a cruise ship, the ship will not wait for you if you’re late. So, make sure you get back to the port with an ample amount of time so you don’t miss the ship! One advantage of booking a cruise ship excursion is that the ship will always wait for your group if you are running late or stuck in traffic. 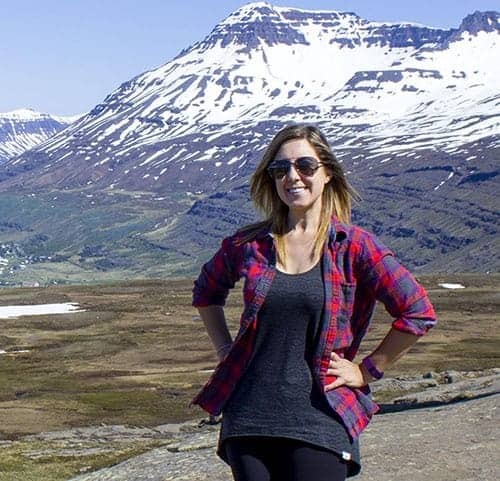 Generally, the tour companies always get you back on time, without any worry or stress. Our vegan cruise aboard the MSC Divina also visited several other Caribbean islands, including St. Thomas (US Virgin Islands), Martinique, Barbados, and Guadeloupe. Interested in seeing more photos? 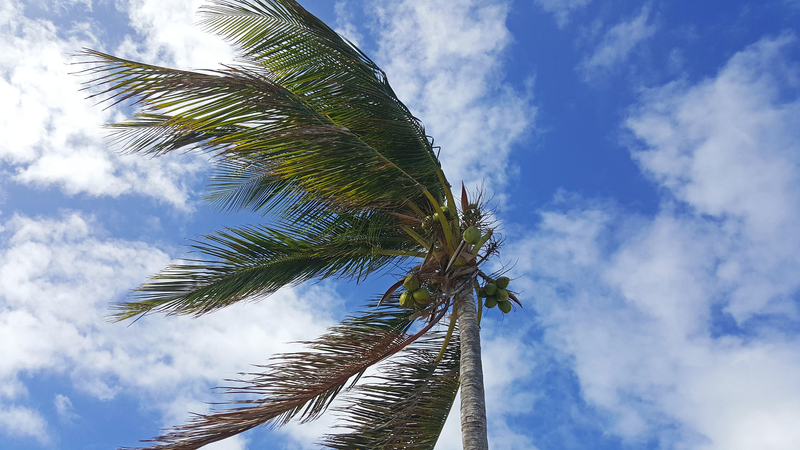 Check out our entire photo album from St. Kitts and Nevis. You can also purchase gifts, prints, and more directly from our travel photo site. Oooooh, I wanna gooooooo there. It looks so amazing an relaxed! Fabulous photos!! I haven’t been to this beach before but well, if you say it will make my jaw drop then I agree. I can see in the pictures that it’s really pretty. I just marked it as part of what I need to visit. Gosh, the aqua blue ocean colours look like a glorious watercolour painting! And I had never imagined such green and lush interior to match the beautiful beaches! Cockleshell looks well worth a visit, especially if it’s a little more secluded than the main beaches, and less commercialised. So surprising that Cockleshell Beach has been missing from vacation itineraries. Looks like a wonderful place to wander. Nice to see it’s not crowded indeed. I have only been to beaches in the United States and it is hard to pick a favorite because I love them all. Cockleshell Beach looks great. It is nice that there is enough room to spread out a little there, it’s more relaxing. I do love when the water is warm and the sand is soft so this beach sounds like somewhere I’d like to visit. 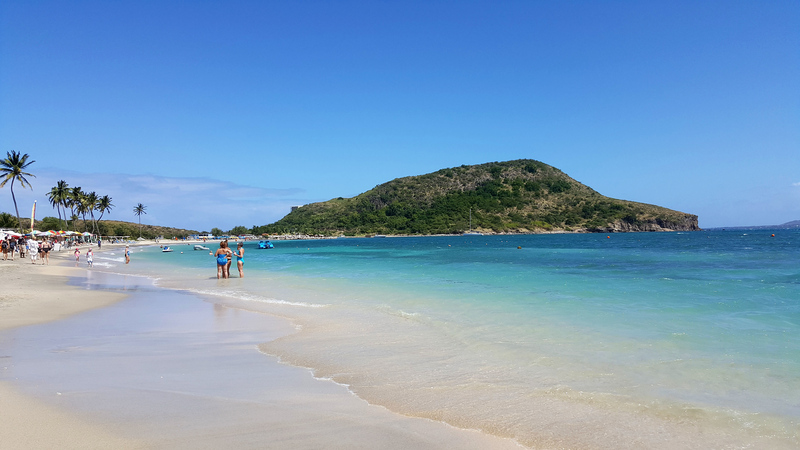 There are beaches and beaches and there is the Caribbeans! It looks most of the time you had very few peole to share the beach with. It also looks windy . Near sunset time was it too cold? I have forever been planning a trip to the Caribbean Islands but haven’t made it as yet. 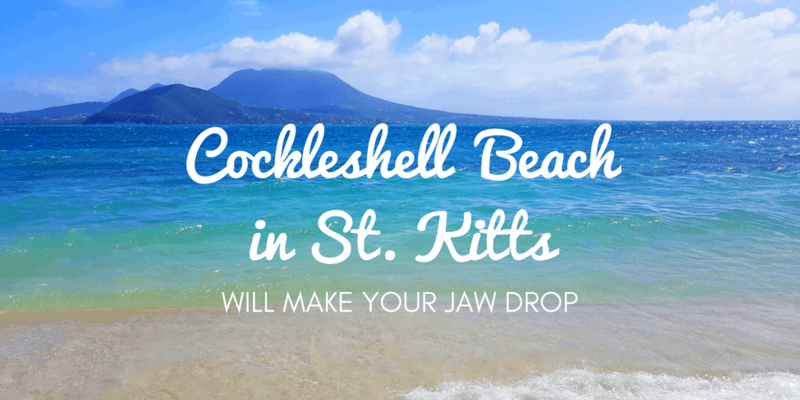 St Kitts is one of the islands on my list and Cockleshell beach looks pretty amazing. The blue waters, the white sands, this is exactly why I want to go! It is always nice to have a beach to yourself and in this case, such a lovely beach. It allows you so much of quality time together. The water here looks gorgeous and I sure would have spent a lot of time in and around it like you. Can you snorkel here? That would be the icing on the cake for me. The beach looks like a perfect spot to be with your loved ones. The pictures are gorgeous and the way the soft sand would have felt on the feet is something that we can only imagine till we are there to experience it.